I read the article regarding Realty Teams bombarding Stony Point. I live on Lea Court in Garnerville. I received the attached, unwanted and intrusive letter in my mailbox today. The envelope had no return address or I would have tossed it without looking. 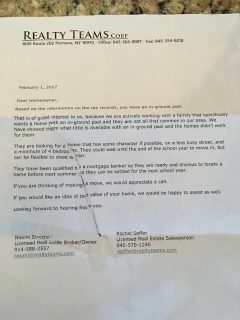 Our neighborhood has been harassed as of late by folks asking us to sell our homes. Buyers have been driving through, knocking on doors and stopping me while out walking my dog. I have recently found out that 10 homes in our quiet neighborhood have sold. These have been quick, quiet sales. We have a very beautiful, friendly, diverse neighborhood with many nationalities, ethnicities, religions and races. Our children play together, we meet for summer barbecues, etc. Our homes were our investment for our future. Blockbusting by this agency or any group whose goal is to wipe any but their own kind from our neighborhood is scary and should be criminal. I’m not sure what can be done other than to spread the word to not panic and run. I do, however, believe that is exactly what will happen. I am worried what will happen to our overburdened, debt-riddled school district when they have to bus children to private schools and if homes will be declared houses of worship, removing them from tax rolls. This is how I feel about the experience. Thank you for spreading the word through your article.